When I was at Bournemouth University I studied linguistics, language evolution, and artificial intelligence . So fascinating and, in my opinion, language evolution never stops, grammar can be broken, new communication means are established, and brevity within a physical context is encouraged. Visual languages, i.e. those that communicate with symbols, colour and the suchlike, seem like the natural progression. The use of mobile devices, the expanding urban landscapes, and the movable population of the world means that we will not need a Tower of Babel, we will need visual systems to help us all communicate and get along. It needs to be democratic and accessible by all. Modern visual language started on the streets. Sure, people go all of the way back to caves, and the Egyptians for hieroglyphics but I am talking about alternatives to modern formal languages. Those systems that are found underground and when they hit mainstream do not sit well with the authorities. In the mid-to-late 1800s times were really tough for some people. Poor men, typically those finding difficulty finding jobs, jumped onto trains, riding freight cars, traveling around the USA looking for work. Over time these people became known as ‘hobos’ (for some unknown reason). 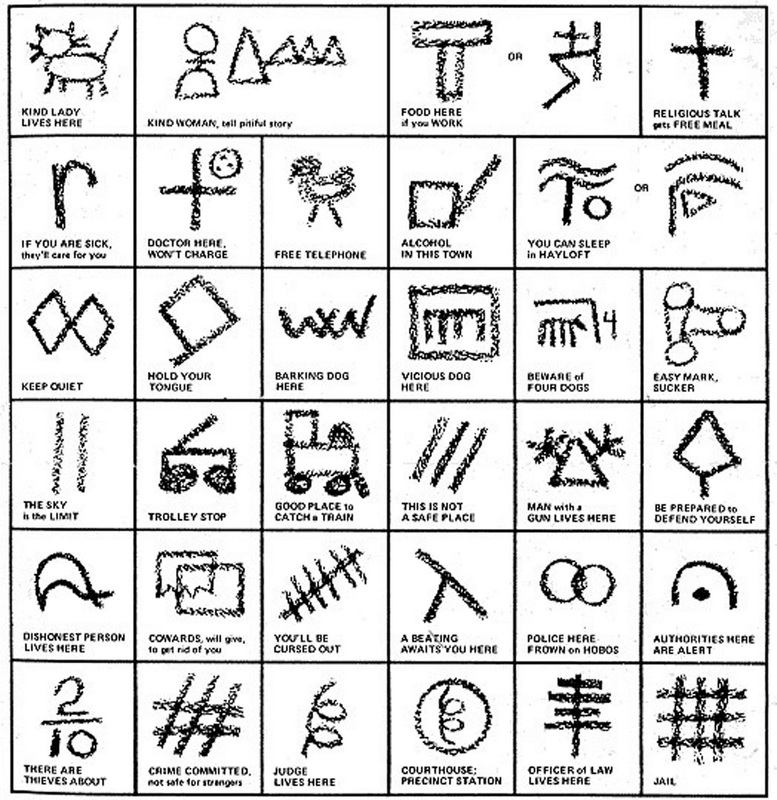 These transient workers found a way to help each other out — a series of glyphs known as the “hobo code” that they would leave at, or near, properties that they stayed at. It was a coded support system. The following video goes into the Hobo Code in more detail. The code even gave birth to new ways of marking territory. “Who is Bozo Texino? chronicles the search for the source of a ubiquitous and mythic rail graffiti— a simple sketch of a character with an infinity-shaped hat and the scrawled moniker, “Bozo Texino”— a drawing seen on railcars for over 80 years. Fascinating. It was the precursor to graffiti and tagging. I grew up in England in the 80s. I remember my first trip to London in around 1982 or 1983. My father and I drove up to Hounslow and we took the tube into town. As we rushed by the suburbs of Greater London I started to see tags and colorful graffiti. It blew me away. I had to know more. It drew me into the hip hop culture. It was a marking of territory and a statement of personality. ‘INFAMY’ is an intense journey into the dangerous lives and obsessed minds of six of America’s most prolific graffiti artists. Directed by acclaimed filmmaker Doug Pray (“Hype!” and “Scratch”) who teamed up with writer, publisher, and graffiti guru Roger Gastman, the movie takes you deep into the world of street legends SABER, TOOMER, JASE, CLAW, EARSNOT, and ENEM. Adam Curtis’ ‘Century of Self’ talks about propaganda and the birth of Public Relations and modern marketing to create the huge retail economies that many nations use as a barometer of fiscal health. Here is episode 2 (go and hunt for the others) that really delves into this. Propaganda mechanisms have been hijacked in modern culture with everything from flash mobs to pirate radio to street artists that take beautification of environments and communication of important opinions and messages to the next level. The Artist JR is incredible in his vision and execution. Here he is talking about his Inside Out Project. And, then we have those that won’t ever conform. KIDULT is one such person. Evolution and progression does not come from permission in visual language. Keep your eyes open on the streets. You’re likely to learn a lot.